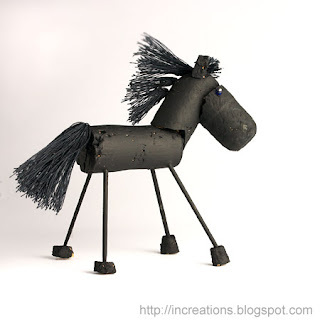 Inspired by this cork horse, we made a different one. 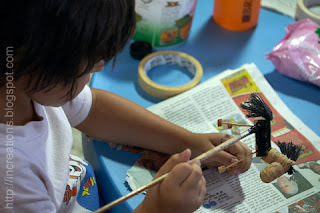 For this project we used 4 wine corks, wooden toothpicks, black thread, glue and a knife. Cut the cork-head so that it fits tightly to the cork-neck, then cut the cork-neck so that it fits to the body. Put them together using the toothpicks and glue. Make four legs out of toothpicks. 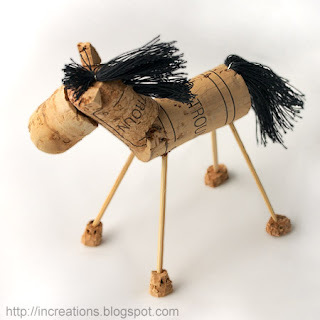 Cut hoofs and ears from the fourth cork and attach them using toothpicks and glue, too. Make V-shaped staples and use them to attach threads for the mane and tail. That's all, in fact. I liked the horse as is, but my daughter loves black horses and insisted on painting it black; and not only insisted, but also did the job. Gouache with crafts glue mixture proved good enough for cork. After the paint dried up, we made two cute blue eyes out of two glass beads threaded onto two pins. I realize this post is a few years old but another blogger recently included it as part of a series on cork projects. Just wanted to drop a note to let you know that this is a great project. I could see the same concept being used to create a virtual zoo-full of animals.